The Travelite Chair in a Bag is a lightweight yet sturdy aluminum transport chair in gunmetal gray. 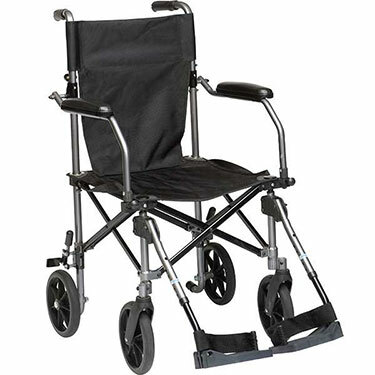 It is easily transportable and comes with a compact carry bag with wheels making it ideal for traveling. Folds for storage and transportation. It is ideal for use indoors and outdoors. 18" square nylon seat comes with lift-up straps. Comes with wheel locks. 8" solid tires. Comes with padded, flip-up desk arms and height adjustable footrests. Seat to Floor Height: 19"